If it hasn’t already, countless times, it will happen eventually. Your trip out has to be canceled due to bad weather. School’s ended early. Holidays began three weeks earlier than you thought they would. Whatever the case, it’s in times like these you need a fun, low-equipment activity to keep the family, most importantly the little ones, entertained and energized throughout the day. 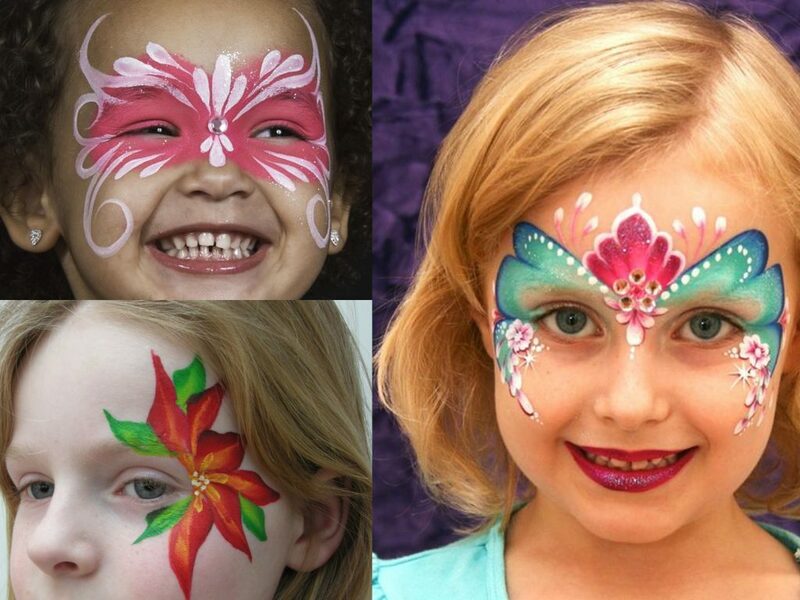 Face painting ideas is just that; fun for all ages, hugely creative. 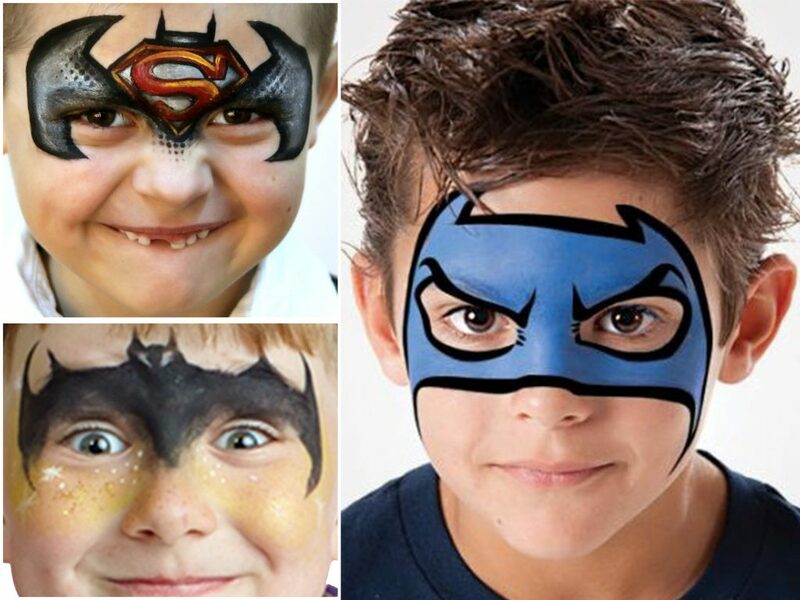 So, without further ado, let’s go through some of the best face paint ideas, for those certain days and nights. For re-creating a butterfly, you can experiment with almost any color, and designs incorporating glitter or decorative gems are easy, too. Since the shape is so simple on its own—a slim body down the nose, large wings covering the eyes and cheeks—there is a lot of room for experimentation. One stroke face painting is often considered a kind of elite form of the art—difficult to pull off, but extremely beautiful to look at. In truth, the one stroke technique only requires ample amount of time and practice to learn, like so many other things. Once you’ve got the hang of it, though, one of the best exercises to prove your newly-gained talent is to try and create a one stroke rose—the complex shape will not only look stunning when complete, but will also be a test of your abilities to make. It will also, however, be quite taxing, and probably take some time to complete, so both you and the soon-to-be wearer need to have some patience. Roses, although a fan favorite among girls especially, are not the only kind of flower you could paint, of course. There are plenty to choose from, and many of them can look stunning, more so if decorated with the right kind of glitter, shine and such. There’s a lot of room for creativity here. How about asymmetric designs, with different flowers on opposite sides of the face? Or light-in-the-dark cherry blossoms perhaps? Let your creativity run wild here—as long as it’s a pretty flower, the girls will love it. Promise. For an atmospheric, summer-friendly design, consider an ocean landscape at sunset. Perhaps there’s an island, perhaps some dolphins swimming by, or a sky full of stars you’d wish to add—again, lots of room for your own interpretation of the concept here. 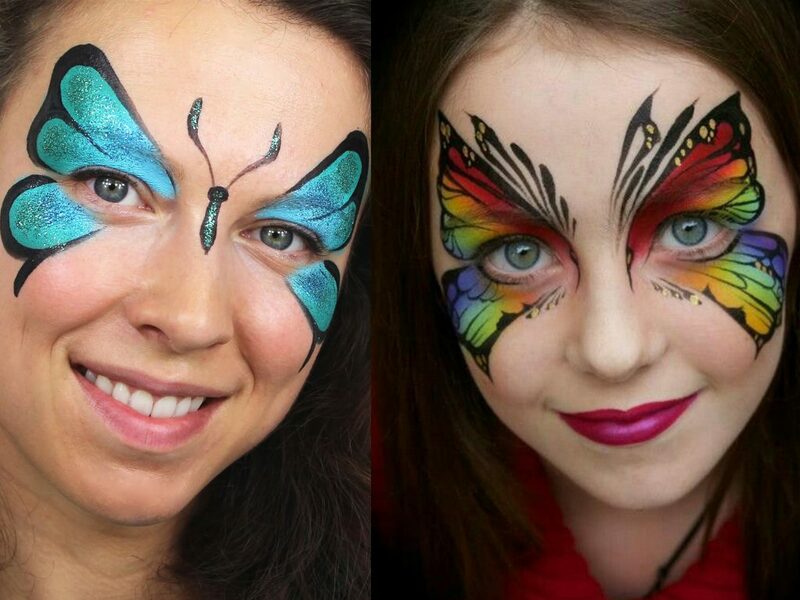 Easy enough to paint, but amazing to look at, this will be a surefire stunning face paint idea for the warmer months. Just remind yourself you’ll need a lot of colors for this one. Being a princess right out of a fairy tale is many a girl’s dream, and a great, fun way to let them move closer to living that dream for real is an elaborate, princess-themed face paint mask. Think of anything that screams female royalty and nobility. From crowns and medallions to long, swooping eyelashes, to elaborate make-up and more. This kind of face paint can very quickly turn quite complex, with lots of elements intertwined. On the other hand, you won’t be needing any large variety of colors—most likely, pink, turquoise and a bit of white will be sufficient. It is fairly easy to see why this is such a great choice: Young boys love superhero figures, and Spiderman happens to be one of the most well-known and popular ones. In addition, his face mask has become an element of pop culture and is recognizable all around the world. 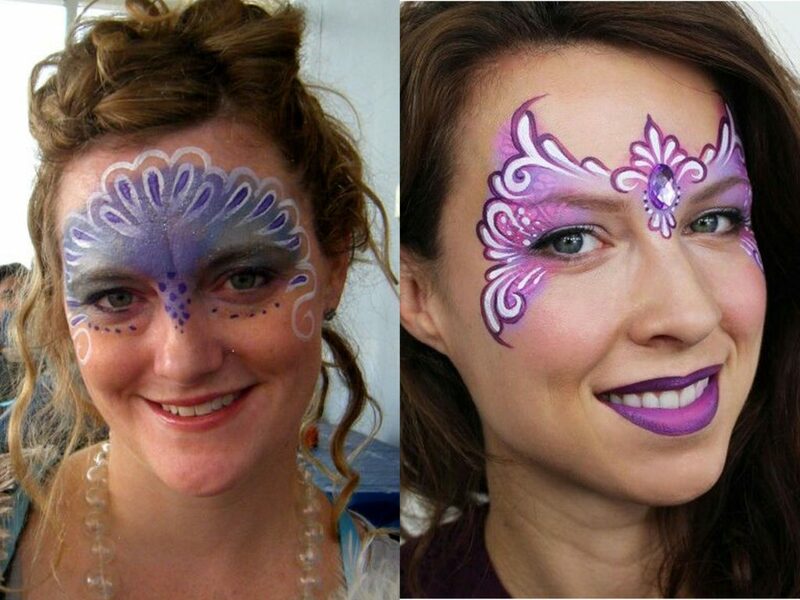 So, recreating it in a fun face paint session should be a no-brainer, right? The caped crusader is another famous character from the world of comics—but transforming your little one into him is going to be a bit different. The classic Batman mask has quite the different shape from the webby, if neatly ordered one that you would find on Spiderman. Still, the recognizable shape of the batwing logo allows you to mess with it a lot more without hurting the look, so you could put your own spin on the formula. Living life as a pirate, going from port to port on the lookout for adventure, bounty and treasure, has been young boys’ stuff of dreams for a long time, both in fiction and outside of it. 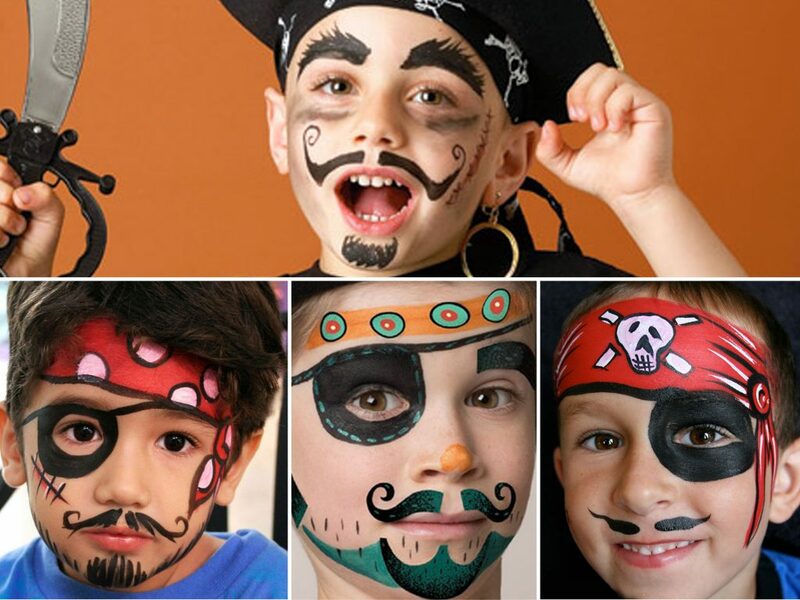 It makes sense, then, that pirate-themed face paint is one of the most often requested kinds among them. To comply with their wishes, you’ll need lots of colors, lots of time, and some skilled work of the brush and sponge. Despite the classic headband-and-eyepatch look, there are lots of possibilities to try out here. A slightly more exotic option, vampire-styled face paint is a blast to create. You would think most of the effect depends on the choice of skin tone and make-up—but you’d be dead wrong. There’s so much involved in a good-looking vampire, from the traditionally high, pronounced cheekbones to the glaring eyes and bloody teeth. Most of your work will be done with the sponge here, but doing details with carefully applied brushstrokes is just as fun. Another pop culture classic. We see them in movies, on tattoos, t-shirts; everything, really. Skeletons are a staple of the human imagination, and they do represent a side of all of us, after all. Though it may seem a bit grim at first, most kids are perfectly fine with looking like the Grim Reaper, as long as it’s just for a day or two. This kind of design does require lots and lots of painstaking detail work, so be prepared for a long, long face painting session ahead of you. The end result, however, can look deceivingly, if not horrifyingly realistic. This is simple; better face paint is easier to work with, and will most likely also look better in the end. The only caveat is the price, of course, but don’t expect to ever have to spend a true fortune on something like face paint. This doesn’t mean buying stuff from expensive brands—In fact, if you know your stuff or have nothing against reading up on it, there is the possibility of making your own face paint. All you’ll need to make sure is that the paint you have really is top notch in consistency and color rendition. Eyes are a big no-no, both if the painter has still some tricks to learn and especially if the child happens to be very young—think what happens if they rub their eyes. Although paint right around the eyes can look great, the risk factor is just too high. Smaller problem zones are the mouth and nostrils, though it should probably be fine to let your inner artist out on those areas in most cases. The instinct to mess with as many colors as possible to make the end result appear more interesting can be strong, but you shouldn’t give in. Applying too many colors and layers at once can and often will result in a blended, washed-out mess, where everything that was once distinct turns into faint, barely describable mush. Not good. If you’re trying out a new design, or just haven’t done a lot of face painting yet, then trying to visualize your plan for your creation on a blank sheet of paper before applying it to the face of your choice is a very good idea. Sure, painting on faces is different from traditional drawing and 2D painting, but this habit of drafting on paper first can go a long way towards improving your accuracy and making sure that what’s in your head actually makes it to the final end result. As strange as it might sound, using your fingers instead of brushes and other instruments can actually turn out great, while not having that much of a learning curve as many painting techniques do. The oils of your skin will spread paint no problem, making fingers the tool of choice for the first layer of paint. Precision brushes and the ever so useful sponge get more important later on, as the painting gains in detail. Many common face paints are quite viscous, so you’ll better to dip your brush into a small glass of water nearby before adding paint. Of course, too much water can cause problems by making the paint drip all over the place, so make use of water only sparingly. Paint on your face for prolonged periods will cause varying amounts of irritation, and can even lead to stained skin. For this reason, taking face paint off at the earliest possible opportunity is a must. Do this with makeup wipes optimally; these clean much more thoroughly and with less effort than simple water and soap. So, what are you waiting for? 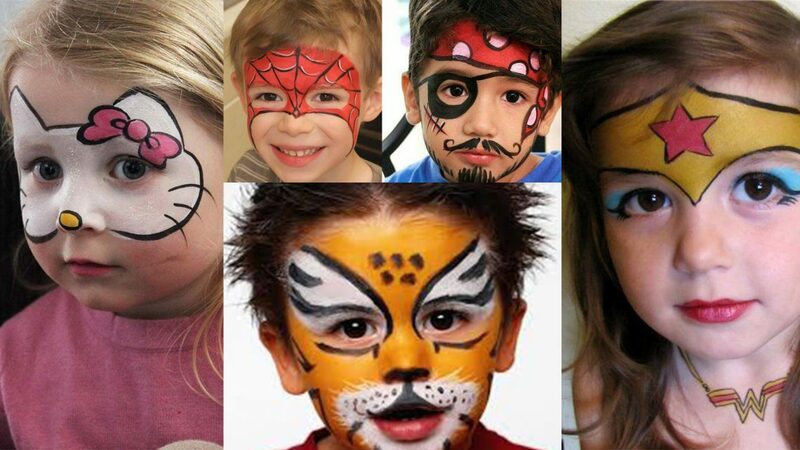 Armed with the knowledge and plenty of ideas, all you now need for a great face painting experience is a lucky face to be your canvas! Better practice some on paper first, though. Just in case.